Food is such an important part of the Italian lifestyle (http://www.lacalla.it/blog/11/how-locals-celebrate-special-events.htm) … all is about food, above all in the South of Italy. But a wedding menu is something even special, it has to be well presented, delicious and, above all, abundant. 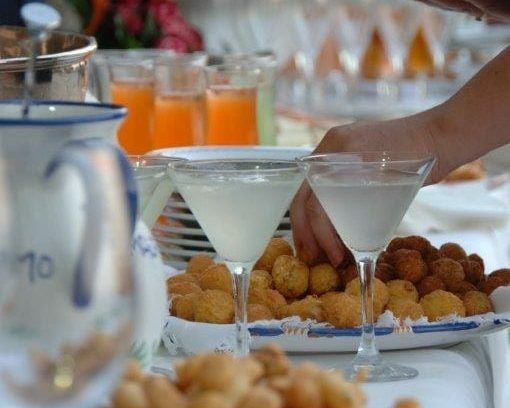 Any wedding meal starts with an aperitif buffet including alcoholic drinks (Italian Prosecco is a must) and fresh fruit cocktails (the most popular one are Bellini, Rossini, Mimosa and many others) and a large selection of finger food, warm and cold canapes, fried vegetables and fish, mozzarella cheese, cold cuts and so on. Usually the welcome cocktail is huge and, sometimes it happens that people not used to such a large variety of food think that’s the whole meal… this is just the beginning… at least 5 more courses will follow, without counting a huge dessert table and a candies table (http://www.lacalla.it/blog/20/confetti-confetti.htm). Italians are big eaters, they love to see a large variety of food, but not big drinkers. Usually, a regular wedding menu includes drinks during the welcome cocktail, half bottle of wine and one glass of dessert wine for the cake cutting, and coffee of course! For sure this quantity of alcohol is not enough for foreigner weddings, this is why one of the most frequent question we get when we define a menu is “can we have a 3 course meal and include more alcohol in the price per person?”. The reply is NO… if “more alcohol” means an unlimited number of drinks as nobody will accept to meet this request. This is why we often suggest to select a basic wedding menu with at least 4 courses and keep a separate budget for wines and other drinks. It often happens that the bill of the bar is double than the whole reception. Including a fixed amount of bottles of wine, Prosecco and other drinks in the basic price per person is a good choice, than you will have the option to offer an open bar (you can also select the drinks to be included) for few hours during the after dinner or arrange a cash bar and let your guests pay for their drinks… this will help to respect the budget. One more frequent question is about the food selection. We, the Italians, do not expect we can choose the menu during a wedding meal. The couple sets a menu in advance and keeps it secret until guests take seat, the venue staff will just provide suitable alternatives for those who don’t eat dishes included in the menu. Many foreigner couples often ask to offer their guests (it doesn’t matter if they are 10 or 100) a choice among 2 or 3 different dishes per each course. THIS IS IMPOSSIBLE…or, it’s feasible, very expensive as the kitchen staff should be ready to serve all the dishes for all the guests and, at the same time, will cause a waste of time as the waiters will take so long to get the order. This is why we always suggest to find a compromise in order to help the staff to arrange a perfect service and, at the same time, satisfy each single guest. If you want to give your guests the option, send them the selected menus (for fish/meat eaters or vegetarians) and ask each of them to make his/her choice in advance and specify any special dietary requirements… a professional team will take care of them on the wedding night and avoid a worthless waste of time. Remember the importance of the timing (http://www.lacalla.it/blog/27/the-wedding-day-schedule.htm), you will never have a 5 courses meal served in 2 hours if the kitchen staff is not ready to serve the whole meal.